All release notes from previous years. Made the Next Step field a bit wider to make it better readable and made it less ‘jumpy’ by showing an option on one line instead of two. You can now click on ‘Works at’, ‘Twitter’ and ‘LinkedIn’ fields to browse to the underlying link. Previously it would also open the field to edit it. It’s now possible to add Teams yourself. Go to the Users list and click [+Team] on the top. Also, we’ve added “team(s)” as a new column so it’s easier to see who is in which team. When you click ‘assign to me’ on a case or deal page, Lily now also changes the assignment to your teams automatically. Big list of email labels? Good news, we’ve added expand and collapse buttons to email labels. Always stay in control to create the overview you need. Cases with a case type that has been archived are now visible in the unassigned cases widget. This way you can slowly get rid of the case type you don’t use anymore, but stay on top of older cases that still use it. Every user that has admin account permission now has a ‘(admin)’ next to their name in the Users list. Made the full button around an email label clickable again instead of just the text. Less precision is needed so you get to where you want to be more quickly. Added a settings page that’s only accessible for users with an admin account. Currently it only features the Time logging setting, but there’s a lot more to come! Time logging is now available in Lily. Easily keep track of how much time you or your colleagues have spent on a Case or Deal and besides being displayed on a separate widget, it shows directly in the activity stream as well. Read more about it in the separate time logging blog. We’ve added more visual cues to what is and what isn’t available in our more limited Personal and Team plans. Email messages you’ve saved as drafts won’t be shown in the activity stream anymore. When you add a contact in email, phone numbers in the email conversation will be added to that new contact automatically. Sometimes Lily would add your own phone number as well, from your signature for example. That’s not what you want, therefore we’ve improved this automatic part and Lily only adds your recipient’s phone numbers. Opening fields to edit them, also known as inline editing, shouldn’t happen when you click on an email address or phone number. If a contact no longer works at a certain account and you’ve set them as inactive, an ‘(Inactive)’ label is added to their name in the Colleagues widget. When we promise, we deliver: importing your contacts is now available! Besides importing accounts by uploading a .CSV file, you can do the same to import all your precious contacts. Head over to the Import-page to learn more. We changed opening fields to a single-click instead of double-click. To edit something quickly, click once the pencil icon or on the field itself. Before, when postponing an expiry date by 7 days, the date would be set 9 days in the future. This was because Lily automatically skips weekend days. We’ve changed this to correctly postpone to 7 days in the future (which are 5 working days in reality). Assigning a case to yourself was possible by clicking on an anchor-icon. We replaced this anchor with an ‘assign to me’ link, as it’s more clear and consistent throughout the platform. Besides recurring costs, one-time costs of a Deal with €/$0 as value will now also be hidden correctly on your dashboard. This leads to less clutter, more room for relevant info. We added visual cues that some elements are not available when you’re on a Personal plan or when email account limit of 2 has been reached. Also, person selector is now visible on dashboard and in list views. However, selecting colleagues is not possible as workload sharing is only available for Team and Professional plans. Added ‘Assigned team(s)’ as possible column to Cases list view. It’s hidden on default, but by clicking ‘Columns’ on the left you can easily select it to show assigned team(s). We’ve improved the time filters found on your dashboard or in lists. You can now select one or multiple time frames: Expired, Today, Tomorrow, Next 7 Days or Later. If you select none, it will show all available Cases or Deals. A lot of people who use Lily for external communication also use Slack for their internal communication. That’s why we decided to make it possible to integrate Lily into Slack! Go to Integrations and easily add Lily to your Slack environment. Sharing a link to something in Lily will now show a nice preview and info straight from Lily. Import of Accounts is now possible. Go over to Import, upload a .CSV file in the correct format with all the accounts you’d like to import and Lily will add them all. Import functionality for Contacts will follow soon! Looking for cases or deals that have been assigned to a team but not a person yet? Select the new ‘[team name] team’ option and Lily shows you instantly! Made some improvements to the users list. It’s now possible to see who’ve been invited. Also, you can resend or delete those invites. Always look at the bright side of life: an empty activity stream will never tell you that there are “no activities to display” but will tell when it was created instead. All Deal recurring or one-time costs with a value of 0 will be hidden on the dashboard. We love to speed things up for you; that’s why it’s now possible to create an Account while adding a new Contact. Improved adding a note to a case or deal, by moving the add note box to the top. Previously it was shown on the bottom, which could go unnoticed when a lot of notes were already added. Add a note on top and it is shown on top. Our integration with Pandadoc has been improved! Easily set up rules according to your team’s needs and deals in Lily are updated automatically when your customers view quotes sent through Pandadoc. Read all about it in the Pandadoc blog and get started with the guide from our knowledge base. From now on, you’ll be redirected correctly to the dashboard when you log in for the first time. Starting September 5th, you will see a new billing area in Lily. Here you can choose which plan you want your team to use starting October 1st. If you choose the team or professional plan, you will also be asked to enter your payment information. On October 1st, if no payment information has been entered, your team will automatically be changed to the free plan. Read all about it on our blog. Improvements have been made to phone call activities in activity stream. You’re now able to add a note to call activities, and double events shown for a single received call are a thing of the past. Changing priority of a Case from Low to Critical correctly affects the expiry date again. The colleagues list when viewing an Account or Contact now shows all Contacts instead of the previous maximum of 9. For all you out there with a massive amount of email templates: nice one! Using email templates really lowers the cumbersome aspects of email while still composing personal emails. However, it can get quite chaotic if you have more than 20 templates. Therefore we introduced email template folders. Easily add a folder, move your templates to the corresponding folder et voila: less chaos, more order. If your telephony integration is active, you’ll receive a notification in your browser when your phone rings. To make sure you receive these notifications, we’ll ask for permission to send you these notifications once you enter your internal number and save your profile under preferences. A lot of activities have been added to the activity streams; incoming phone calls (if telephony integration is active); Case status changes; Case priority changes; Contact and account information changes. It’s now possible to properly remove Twitter and LinkedIn handles from a contactor account. Lily will save every address even if you only filled in the postal code or city. Previously, only fully completed addresses added to a contact or account were being saved. The devil is in the details; we added colors to the activity stream filter per item. Putting the filter on deals shows a checkmark with a green background, notesoption shows as yellow, etc. Besides building bigger functionalities, we like to add details that add some colorful sparkle to your daily job. Your email will never be shared outside your organization. We changed the text on email overview from “Public” to “All” and added a tooltip to make that even more clear. More improvements to the email sharing part will be made in the near future. Removed the possibility to ‘Merge activity streams’ when viewing a case or deal. Sometimes we try new features to see what works and iterate accordingly. We prefer creating a great interface by default rather than giving you multiple options which might make Lily confusing. Therefore the latest activity regarding the caseor deal will be shown on top. If you scroll down, you’ll see the last activities regarding the linked account. When the contact you’re in touch with stops working at an account, set that contact to inactive. All his/her communication history will be saved but email address and such will be hidden from the account’s page. You have access to their full history without accidentally calling the person who no longer works there anymore. We did a full overhaul of the activity stream. Now you will find better placement of avatars, dates, and other elements, resulting in a more calm overview where less is more. Besides overhauling the activity stream, we’ve also polished the filter. It’s easy to filter out all the other stuff if you only want to see notes, emails, cases or deals in the activity stream. Basic text formatting options have been added to description and notes, similar to those used on Github. Take a look at the basic writing and formatting syntax. Full address is now selectable as a variable to add within an email template. Deleting the ‘works at’ link of a contact with an account wasn’t saved correctly when inline editing it. You’re now able to enter a contact’s full LinkedIn link. Copy and paste the URL, that’s it! While creating a new deal or case, previously you would be assigned automatically. Now your team is also selected automatically. The updated activity stream preview now shows the difference between the four email privacy options. Widgets on the dashboard are now resizable. If a widget is fully expanded, one click changes the width to 50% and a second click will fully collapse it with only the title being shown. Click it again to make it full size again. Clicking once on the anchor icon now allows you to easily assign an account to yourself. We’ve made the field for case title a whole lot bigger so you can read the full title while editing it. Clicking the ‘what’s new?’ button in the top-right menu gives you quick access to the newest Lily updates. The ‘more info’ link to the Email accounts screen redirects to a helpful article in Lily’s Help Centre to give you more information and guidance on email accounts in Lily. If you have a list of email addresses (in Excel for example) and want to send an email to all of them, easily copy and paste their email addresses into the To: or CC: field when composing an email. More ways to add a twitter account in the account and contact forms have been added: it’s now possible to enter just the Twitter handle, (ex. @SayHelloLily) or the full URL (ex. https://twitter.com/@SayHelloLily). Due to an issue, Lily used to send you to the dashboard when clicking on an email address inside of an email instead of the compose email view. This has been fixed. Email addresses of accounts/contacts can be set as primary, other or inactive. When you set one as primary, that address will always be listed on top which makes it easier to send to the most relevant email address. Case type and status have been made quickly editable in the My cases widget on your dashboard. Just click on them and edit right away. We’ve been talking about a ‘timeline’, ‘history list’ and ‘communication history’; now all the moments you’ve been in touch with an account or contact displayed as a list of items will now be referred to as the ‘activity stream’. More information on this will follow in a separate blog post soon. Everything on your Dashboard will now be live updated. If a colleague assigns a case to himself, you’ll see that case disappear from your team’s widget. Even if they update the subject, date or any other visible info, you’ll see it happening live. Email widget will only be updated every 60 seconds, as we’re technically restricted to update it live. But, no more need to refresh your dashboard ever again. Feels like magic, doesn’t it? We found out that once you activate two factor authentication, your email account in Lily stops working. One simple solution: add your email account again. It’s needed to keep Lily and Gmail synchronized. As we’ve transferred from a closed to an open beta, Lily’s new registration form is now available. You’ll no longer have to wait to start using Lily, but can start right away after registering. Both the registration and login form got a wonderful makeover. Fresh and clean, in the same Lily style we love. Major improvements to both! Every page in Lily keeps getting improvements. It was time to clean up the Case detail view and only show the info you need. We’ve also switched the activity stream to the right and the Case details to the left, to see if it works for you. All items in the activity stream have been simplified. Less clutter, less distracting elements and more useful info. We might’ve removed a bit too much elements, but we’re always listening to your feedback to keep it all balanced. Made some changes to the Add Note box: removed the cancel button, smaller text-area but it will expand according to the amount of text you’ve entered. Every item in the activity stream is expanded by default, as we’ve removed the ability to expand or collapse them. Added ‘Created by’ info to the Case page. Archive button is available again on the Deal page. A lot happened in May. We added a lot of new functionalities (two factor authentication! ), made great improvements to existing parts of Lily and launched the beta version on the 19th during The Next Web. When you move an email to trash, it will delete after 30 days. If you delete an email from trash, it’ll be deleted directly instead of showing up in trash again. Lily will detect any phone numbers in email and automatically fill in the Contact’s phone number if you haven’t added them as a contact yet. Yes, Lily keeps upgrading her magic tricks. We’ve added more possible colors to the next steps for Deals, as some didn’t have a cool colored bubble next to them. We’ve added some more colors, to easily identify what needs to be done next. You can now filter on Account status in the Accounts list. Makes it easier to get a list with just your prospects or current customers. Searching for a phone number but not sure whether it starts with a country code or not? Don’t worry, Lily will automatically show all results. Searching for ‘+316x’ will also show ‘06x’ and it works the same the other way around. Security page has been added (top-right menu -> Security). You can view the current active sessions and set up two factor authentication. There are several authentication methods you can choose from: a token generator, text message or using a YubiKey. By using another factor besides your password, you’re greatly improving the security and making sure no one else except you can access your Lily account. Notes added on a Contact page, will show up in the activity stream of linked Account(s). Changing priority of a Case affects the expiry date. We’ve made sure this happens correctly on every page where you can edit the priority. When merging two accounts or contacts together, double entries (for example, two identical email addresses in the old and new Account) will be combined. ‘Move to’ button in email is hidden if there are no available labels/options to move an email message. Until now, Lily changed the expiry date automatically when you edited the priority of a Case. Lily also changed the next step date when selecting a different next step. We’ve made these auto increments of the dates more visible by adding ‘(+x days)’ behind your selection. Add your own profile picture to an email template and make it more personal. The email template variable can be inserted in an email template under User -> Profile picture. In the past, a Case and Deal widget for every team you were part of was visible on your Dashboard. Once you joined two or more teams, your dashboard would be one big mess filled with widgets. We’ve combined them all into two widgets, where you can select which team’s Cases/Deals should be shown. A better overview on what to do next, so you can focus on what you do best. It’s now possible to search on customer ID for Accounts. When you sign up for Lily, a Case and email will be handed over automatically to give you a nice introduction to Lily. Easy editing by double-clicking works again for Account name + Case/Deal titles. Setting an email address as your primary now also works for shared email accounts. Set a shared email account as your primary and it will automatically select it when you compose an email. A note or description field will now properly resize according to the amount of text. Buttons to add a new Account / Contact / Deal / Case now all look the same everywhere. Consistency is key. Subtle design improvements have been made to the aforementioned add buttons, the magic wand button and space between fields in forms for a cleaner overview. It’s now possible to view a Case/Deal even though the linked Account or Contact are deleted. Do what needs to be done and link the Case/Deal to correct client after. Cases/Deals are now properly removed from widgets and lists after they’ve been deleted. Email accounts got a complete overhaul. Besides a more clear overview with all your email accounts, we’ve also added new and more clear possibilities. It’s now possible to have your private inbox and only share metadata with colleagues.Another option is to either allow or deny specific colleagues from your email. For example: add your email account as a private inbox, only share metadata with one colleague and give full access to another. Or add it as a mailbox for all colleagues, but exclude two colleagues who’ll never use it anyway. You’re in full control. Read all about how to share your email in our knowledge base. Once the beta is live, you can choose between three pricing plans: Free, Team and Professional. We’re currently building a great subscription model to easily register your company and add your colleagues as new users. Subscribing will become smooth and you can pay with your preferred payment method. Buttons disguised as links to add an email address, phone number and address in a form have been changed. First input fields are visible right away, which makes it possible to complete a form by just using your keyboard. It also makes the form a whole lot smaller and less overwhelming. A small bug that occurred when editing a deal was fixed: Lily would set business to existing while it was originally set to new. The person selector can be found on the top right of a widget or in list views. On default, you’re the only person selected. If you select one or multiple colleagues, Lily will show cases and deals linked to them. By (de)selecting everyone on the list, everything linked to anyone will be shown. Teams are now also fully expandable and collapsable, so you could expand teams only relevant to you. 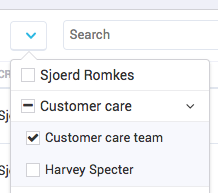 Previously only colleagues in a team were visible in this selector; we’ve added a section ‘Not in team’ where all the other colleagues reside. Recent email communication was already being shown in the timeline of Accounts, Contacts and Cases. We’ve now also added it to the Deal detail view as well. If the deal is still open, all communication of today and two days before will be shown. Once a deal is closed, it will show history of the closing day and two days after in the timeline. When you assign a case or deal to someone and that person is also in a team, Lily will automatically assign it to that team as well. No need for you to remember it and saves some clicking! Once you log in for the first time, you’ll now be prompted to synchronize your email account. Without email, you’ll miss out a lot of Lily’s superpowers. And yes, of course you can skip this step if you want to add it later on. Reply all works correctly again; once you ‘reply all’ to an email, all original recipients will be copied into your new reply email. A few weeks ago we implemented a suggestions feature: if you’re adding an account or contact with an existing name, we will show them as matching results. We’ve expanded this feature by adding an option to merge new info (such as description, phone number and address among others) with the existing info. It sure beats copying and pasting new stuff into existing entries! When you add a deal and link it to an account that you’ve done business with in the past, Lily will automatically set business to existing. Now, Lily will also hide three fields (‘found us through’, ‘contacted us by’ and ‘why customer’), as you’ve already filled this in the first time. You’re no longer able to save an empty note. Yes, really. Added possibility to assign a Deal to one or multiple teams. If you’re not sure who of the sales team is going to handle the deal you’re adding, easily assign it to the whole Sales team. They’ll find it on their dashboard in the unassigned Deals widget and start their magic! You can now quickly assign an account to yourself by using the ‘Assign to me’ button. Country’s code of a phone number (+31 for The Netherlands, +1 for USA, etc) will be automatically added by Lily based on the address you added to a contact or account. If you haven’t added an address yet, the country code will be based on the country of your registration address. If someone is calling with a phone number not yet known by Lily, a popup will show with the number. If you click on it, the [+Account]-page will open. Lily will now show a hint to add it as a Contact instead and move the phone number over to the new form automatically. No need for you to copy and paste it. Document widget is now shown on every Deal page, if you’ve added Pandadoc as an integration. A bug was causing to widgets load endlessly on your dashboard. Well, good news, we’ve fixed that! You win some, you lose some. ‘Lost reason’ is now selectable as a column in the Deals list view. Set filter to ‘Lost’ and you get a great overview of all the Deals you lost and why. Makes it easy to see what happened and what could be improved to win upcoming Deals. Some of our emails were a bit technical and not very clear. We’ve made some improvements to the emails you get when you’re invited to Lily and when you reset your password. Lily’s capabilities are always expanding: we’ve made phone call integration possible. When someone is calling you, you receive a popup on your screen. If you click on it, it opens the Account or Contact linked to the phone number instantly. Once you receive a call from a phone number that’s not yet known by Lily, the popup will let you add a new Account or Contact with that phone number right away. You can read more about it and how to set it up in our help center. While adding an Account and you enter a company or website that Lily already knows, she’ll give suggestions with the existing Accounts. No more double entries! Tags were great, but we’ve made them even more useful. Instead of one huge pile of tags they’re now separated between accounts, contacts, deals and cases. Less clutter, more overview. It’s now possible to archive email that has a label. By selecting email and clicking ‘Archive’, Lily moves it to ‘All mail’. You can now achieve inbox zero and save the conversations as a link to the past. We’ve made the Archive button a separate status button in case and deal detail view. Lily had some issues with Firefox. We’ve made sure they’re best friends again. While solving things with Firefox, she made a new friend! Moneybird is here: you’re able to synchronize contacts from Lily and to Moneybird. No more time wasted on double administration and keeping everything up to date, extra time for more enjoyable work. We’re slowly introducing Lily to new worlds like the previously mentioned Pandadoc and increase her skills. A separate integrations page has been added under Profile so you can easily add and edit them. A lot of improvements have been made to Pandadoc integration. No one likes entering the same client data twice. Creating, sending and receiving Pandadoc documents with Lily really organises your organisation. Assigning yourself or colleagues to one or multiple teams is fully up and running again. Like with every new colleague, it takes some time to get used to each other. We’ve added several explanations to screens so the introduction to Lily is more smooth. Don’t be shy, take a look around and see what she has to offer! When you’ve added Pandadoc as an integration, a new widget ‘Documents’ will now be shown on the deal detail view. With this documents widget, you can easily add and send quotes. After sending a quote or invoice to a client, it will show up under documents with the current status. Also, Lily will help you as much as possible with your quotes and invoices by filling in known data such as name and address. New updates will be deployed automatically almost instantly. No more long-awaited updates every two weeks, but updates every day! We’ll still give you an update through this blog regularly. Lily will never keep growing and getting more mature every day. Integration with Pandadoc is now available. Hook up your Pandadoc user and start creating quotes. Lily will automatically fill in already known info such as name and address. Assigning a deal to yourself or a colleague is not required anymore to create it. If you’re not sure which colleague will start working in this deal, you don’t have to assign it. A new ‘unassigned deals’ widget is now available on your dashboard. Easy to see which deals you can start working on. When adding a case or deal, Lily will check if there are any open ones for the chosen account or contact. If so, they’ll be shown to you as suggestions. No more need to check if there’s currently an open case or deal created for a specific account or contact; Lily will tell you. Do your thing more efficiently and easily prevent duplicates, nice! It’s now possible to move an email to a different folder when it’s opened in the detail view. Implemented search functionality in the users list. Selecting a (different) primary email account saves correctly again. Added possibility to easily include an image link in email templates. Improved the ‘Assign to team’ search field by only showing relevant search results. A new functionality that goes by the name of Call Integration is on the horizon. When someone’s calling you or recently called you, click the new ‘Caller info’ button in the top right. Lily will automatically show the account that’s linked to it. Priority can be edited faster by simply clicking on it. Thanks to this feature, you can change the priority of a newly assigned case before accepting it. Really long Deal and Case titles will no longer overlap buttons and info on the detail view. Stats page has been removed for every organisation except Voys. It’s no longer possible to assign Deals or Cases to inactive users. Default currency of Voys SA has been set to South African Rand. It’s now always possible to quickly pick a next step date of a Deal, except when the next step is set to ‘none’. New Cases and Deals created by yourself will no longer show up in the ‘newly assigned Cases/Deals’ segment on the dashboard. Existing Cases and Deals that are reassigned to you, will show up in the aforementioned segment. Never lose track of anything new! Customer ID can now be shown in Accounts list view. You can do so by selecting it under the ‘Columns’ button. Next step date for Deals is shown correctly when editing. It will also stay visible while saving. On smaller screens, we’ve improved the overview of email. The supercards on the right will slide down under an email if your screen width is smaller than 1200 pixels. On the email templates page, it’s now visible which one you’ve set as your default(s). When you click the [+]-icon to add new fields during editing an Account or Contact, the new field shows up top instead of bottom. You can directly begin typing, without the need for scrolling up to the correct field. Less jumping around of elements, more clear overview. Description and note fields will now scale with the amount of text: this makes all written text visible while editing, to give you a complete view. If you’ve missed a required field while you’re adding something new, Lily will automatically scroll back up to remind you. New created cases/deals that are assigned to you, will show up in a new segment called ‘Newly assigned to you’ on your Dashboard. You won’t miss new things to act upon and can postpone it if you wish. If you add a Contact and enter a name that’s already known, Lily will ask you if you want to edit that contact instead. Same function works in Email; Lily will ask if you want to merge info with an existing contact. Less duplicate contacts, less manual input, more time for you. Shortcuts to save with the keyboard have been improved. Fixed the functionality for for Mac users (CMD+Enter, Windows users CTRL+Enter) and we’ve added the possibility to save notes by using this same shortcut. A lot of search improvements have been made to show you better and more relevant search results. The last added and most used tags are shown below the Tags field. Currently all tags are shown between Accounts, Contacts, Deals and Cases but in the future they will be separated. Buttons for ’Deals to check’ are now working correctly again, you can now check Deals from the dashboard by using the same checkboxes. Your own email address will be removed when using on ‘Reply all’. List views were a bit messy by showing call numbers and email addresses in different orders per Account or Contact. From now on, email address will always be shown first and telephone number second. Just like in the forms and everywhere else in Lily’s interface. Cases with a ‘Callback’ type will no longer be available in a separate ‘Callback requests’ widget. Instead, they will show up among your other cases in the ‘My cases’ widget on your Dashboard. That being said, scrolling down a page should now be easier – when you reach the end of a widget, you will start scrolling down the page itself. ’Save and Archive’ button has been removed from the Deals form, because it doesn’t fit the Deal workflow and was never used. Twitter profile will be filled in automatically if it’s available from the primary website. To quickly edit information, you can now double click it. Thanks to this, start editing by double clicking inside the field or on the pencil icon. It’s also possible to select and copy information without unintentionally opening the field. A longer than usual title of a Deal or Case is now easier to edit on the page itself. The ’All mail’ inbox now shows all mail without any spam or deleted emails. A convenient way to find back your Archived mail. Email styling options are always visible, quite handy if you’re composing a long email and want to change the font type. No need to deselect your previous default email template anymore: selecting a new one and hitting ‘Ok’ is all you need to do. You can now save anything you’re adding by using the shortcut CTRL/CMD+Enter to Save. Most forms can now be completed without using a mouse. Perfect if you’re a keyboard warrior, and it even works for placing Notes! Easily select multiple emails by holding shift while clicking the selection boxes. If you select the first email, hold shift and select fourth email, everything in between (in this example, second and third email) will now also be selected. Opening an email has been made easier: you can click anywhere in the white bar around the name / subject and it opens. No more need for precise clicking on the subject. The ‘Preposition’ field is gone and has been merged with ‘Last name’ into one field. If for example you add a contact named ’Kees de Vries’, you should add ‘de Vries’ into the last name field. Alignment and spacing improvements have been made to the Account and Contact forms. Adding addresses and other contact information takes up less space and looks much cleaner. Emails with a different reply-to address, will now select the correct given addressee instead of the sender’s address. When you wanted to delete something, a nicely styled pop up showed up to confirm your choice. Now, whenever you change an expiry date / next step date, you’ll see the same pop up. All the pop up boxes have the same sweet, clear looks. ‘Add email template’ button has been moved to the top of the list. The bottom email buttons ‘Send’, ‘Draft’ and ‘Discard’ now all have the same looks as the ones on top. Deals and Cases that are shown in a history list, now contain a description. More info accessible with less clicks! Even though there were no account or contact phone numbers filled in, little building icons were still being shown. Quite unnecessary and therefore we’ve removed them. Clicking on your current page in the menu will refresh the page. For example, if you click on ‘Dashboard’ while you’re already on the dashboard, it reloads the page. If you select one or more emails and perform an action, for example archive, the checkboxes will be deselected once you’ve clicked on Archive. Notes that are pinned can be edited and saved again. On the Deal detail page, contact details are now shown correctly. You can now find Cases and Deals by typing in the name of the linked Account or Contact. Added link with Freedom for Voys SA. This makes it easier to look up clients in Freedom and write quotes. Notes are now sorted on created date in the history list. Adding a new note is better than editing an old one. Email sent to reset a password has been improved. A lot of time was spent to fix some unexpected email issues. Layout and font issues should now be solved. It’s now more clear which email inbox is currently selected and being shown in Email. Buttons to view, edit or delete a case / deal / note in history list now have the same color and sizes. Easier to find and more relaxing to look at. Full telephone number is now readable in the colleagues widget on smaller / resized screens It has been merged with email address into an contact information field in the Colleagues widget. Sorting options in the dashboard widgets have also been optimized for smaller / resized screens. ‘Freedom quote ID’ field is now hidden and only visible for Voys. Several fixes have been made to stop some emails from freezing up. Email labels removed in Gmail are now also correctly removed when viewing email.